This email from the fine folks at Lucero is just what we need to see! It is increasingly rare to find a retail email with barely a trace of promotional marketing. Smart move Lucero…marketing to the sick in bed with the flu segmentation! The headline reminds us to Take Care Out There, and for our household, the timing is perfect (4/5 have been down recently with the flu). We could all use a bowl of that tasty looking soup (with recipe) featured in the hero. 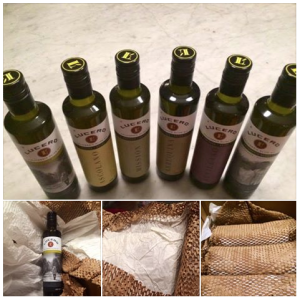 On a semi-related note, a recommendation to all our foodie friends out there: Lucero’s olive oils are some of the most delicious around, and can be ordered online here. 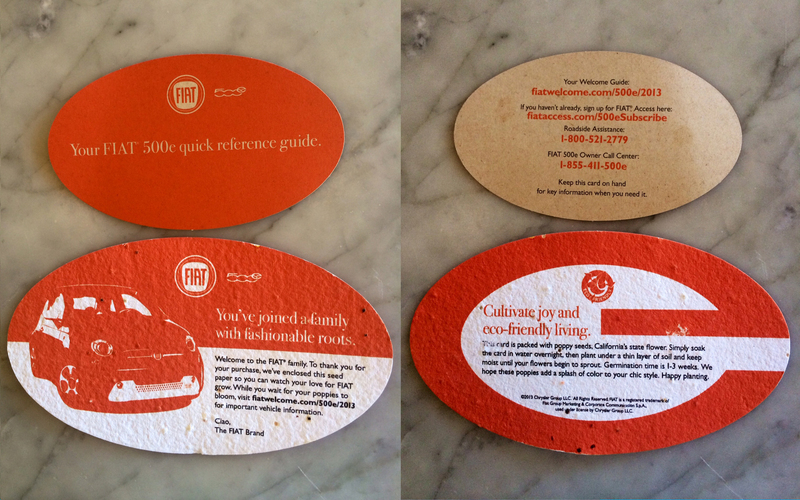 As greenies and frequesnt online shoppers, we give them a ★ ★ ★ ★ ★ review for their perfect packaging for shipping… Everything is compostable! One of the questions we most commonly field is “What is Responsive Web Design?”, and we typically answer from a Coding perspective. In a nutshell: the HTML files are coded with flexible images and media queries so that the design will render differently based on the viewing device (say desktop vs mobile or tablet). 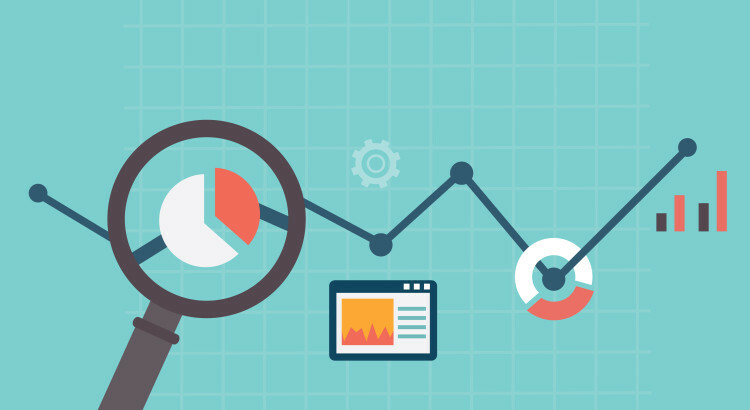 Coding for RWD is more complex, and typically takes 50% more time than non-responsive. Additionally, the designer and the coder need to be on the same page, and therefore communication time is also typically increased. We came across this stellar blogpost from Sandijs Ruluks with the FROONT team on 9 basic principles of responsive web design, which addresses many of the questions from a Design perspective. As the saying goes: A picture is worth a thousand words. We think the animated GIFs included in the article are worth a lot more. Check it out! Happy 99th(!) Birthday Chuck Williams! This promotional email from Williams-Sonoma is in honor of their founder’s birthday. Chuck Williams is a true pioneer and is a legendary figure in the hospitality and retail industries. To read more about Chuck Williams’ life and the Williams-Sonoma legacy, go here. From contractor to hardware store owner to founder of a multi billion dollar high end retail chain, his life story (thus far!) is an amazing one. As a side note, I had the pleasure to take care of Mr. Williams a few times, back in my prior career in the restaurant industry at Fleur de Lys. I am pleased to report he was a very gracious and humble guest, and it was a true pleasure to serve him! Subject Line: Hello Sonoma! Join us for our Grand Opening Celebration! In related news, the original Williams-Sonoma retail store in Sonoma is set to have its grand re-opening this weekend. Mr.Williams and the Williams-Sonoma team have much to celebrate! 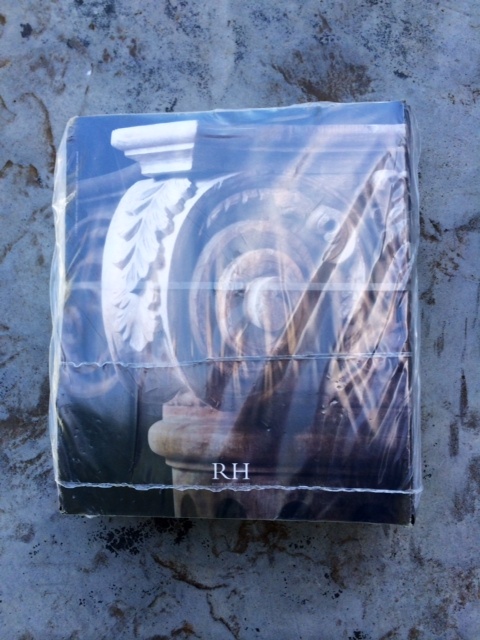 Bad move Restoration Hardware… As greenies and digital marketing proponents, Code à la Mode cannot support the distribution of this collection of catalogs (which RH refers to as “Source Books”). 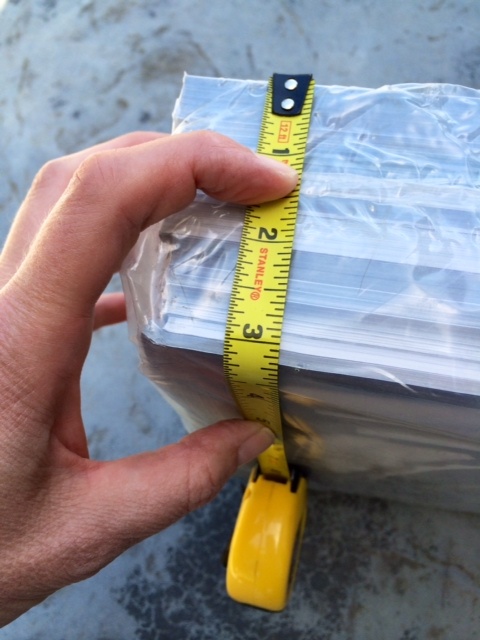 They are weighing in at 17 pounds and measure more than 3″ thick! 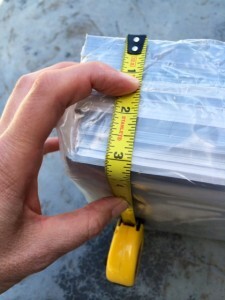 While there may be a market for designers and decorators who prefer to receive the hard copies, it would be better to have the delivery as “opt in”. BTW, if you received one of these behemoths, and want to do the environment a favor, you can remove yourself from the mailing list here. For the love of the earth, PLEASE, help save the trees! 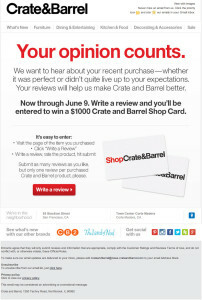 Subject Line: Tell us what you think and you could win a $1000 Shop Card. 2. The request for honest feedback (for better or worse). It’s not all “Rah! Rah! Tell us how great our stuff is”… Negative feedback can be an asset. Presumably, if a particular item receives copious amounts of negative reviews, it will lead to product improvements or removal from the available inventory. 3. The enticement. 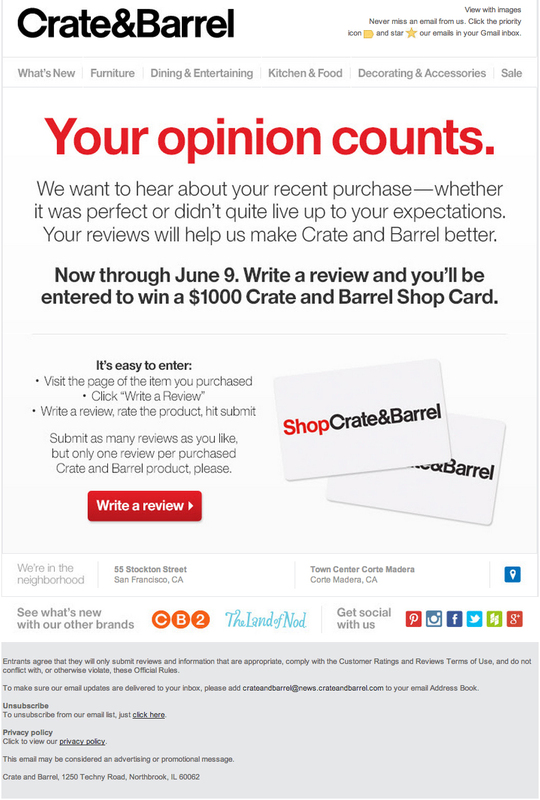 Crate&Barrel uses an attractive sweepstakes offer to compel its customers to complete product reviews. 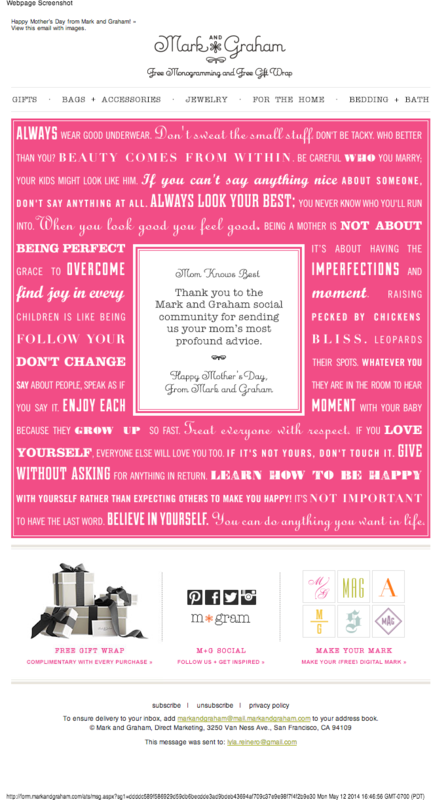 Who wouldn’t want a $1000 shop card? 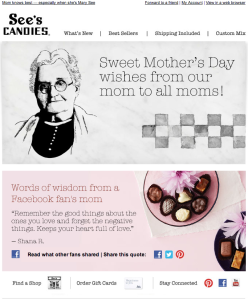 Check out my previous accolades for C&B email campaigns in the Gold Star Email Award written for The Retail Email Blog, and Happy Trigger Email for the Responsys New School Marketing Blog (now known as the Oracle Marketing Cloud Blog). 1. Use a clear and concise subject line that does not include any SPAM-y language. Most Subject Line Best Practices dictate that it should be no more than 35 characters, and with the primary message upfront. Also, avoid using all CAPS or $, as many Email Service Providers will filter your email and deliver to the SPAM folder, where its chances of being viewed are slim-to-none. 2. Provide an incentive. Be it extra miles, a chance to win a sweepstakes, or a gift card… You are asking your customers to do you a favor…show your appreciation and make it worth their while! 3. Be up front about the time needed to participate. Nobody wants to get sucked into taking a survey, only to find that the questions are seemingly never-ending! And be specific about the time… “Short” is relative, “5 minutes” is quantified. 4. Be clear about who you are. If you are using a third party to send your survey email, make sure to include your organization’s name in the subject line. If you are partnering with another organization, consider giving a brief explanation as to the reasons and benefits for the partnership. 5. Make it personal. Include the name of your respondents in the subject line and/or body of the email, and any other relevant information. 6. Give a deadline. This serves dual purposes: it provides a sense of urgency to complete the survey, and informs those survey takers who may not have time when they first open the email that they can’t procrastinate indefinitely. You may also want to consider sending a reminder message if your survey-takers have clicked on the original email, but not yet taken the survey (assuming they have not opted out from the first send). A well-crafted email using the above Best Practices will ensure that you have a high participation rate in your survey.